I've been travelling this route regularly since November and realised, as I was noticing more of the view, how much lighter it is at 1600/1700 in the evening. A great reminder, and link to landscaping your life (a process I use with clients that uses landscapes as metaphors for life), that timing is everything. We can look for the root cause of a problem and not be able to find it because its hidden. Choose a different time of day, day of the week, time of the month or season and you might just find what you're looking for. The solutions are there - you just need to keep looking. Earlier in the week problems with the oven in the hotel room reminded me to not make assumptions about the amount of information you need to provide for your communication to be clear. Today's communication lesson came from the tap!! Perhaps I was just a little sleepy this morning but it wasn't until I had the setting as shown that hot water was an output. Taps, like people, are all subtlety different, and in order to understand how to achieve your goal you need to know how they work. 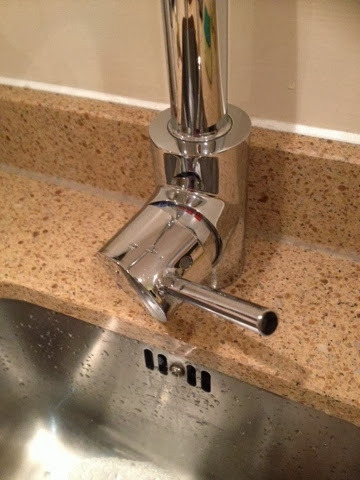 This tap had some colour coding - with people it's not always so obvious. There will, however, be lots of clues about their preferred means of communication. The key is adapting the content, style, method, timing and quantity of communicatin to suit the individual. If you're having problems communicating with someone what clues might you be missing on how to change your communication? Plenty of previous blogs have touched on the clues people give about their preferred means of communication. Once I'm online properly rather than using the app to write this I'll provide some links. I've a combi oven in my hotel room and I learnt a valuable lesson tonight. If you make assumptions about how to make it work, and just press buttons, you may end up with food that's not cooked. Once I found the instructions I pressed the buttons in a different combination, and low and behold the food cooked, bubbled and browned. How often when communicating with others do we do the same - assume we've provided enough information when they actually need a little more detail in order to fully understand what we're wanting them to do. "Ladies and gentlemen welcome to tonight's flight to Glasgow"
Which certainly got our attention as we were on a flight to Edinburgh. It was followed by the flight attendant then saying "now I've got your attention I'd appreciate you listening to the rest of the safety briefing." A great example of doing something differently, and moving what many of us hear unconsciously into our conscious awareness. I just wonder, if we heard that every time we flew, how soon it would be before we stopped paying attention. That's the challenge with any communication we have with others - getting their attention. If we keep doing what we've always done - sooner or later people will stop paying attention. The key is finding different ways to ensure people hear what you're saying. 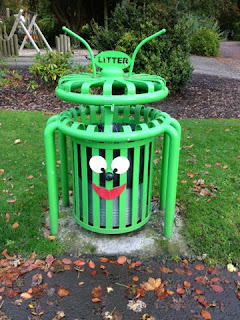 In other words every time we speak we need to be like the bin in the picture above - different, compelling and useful. 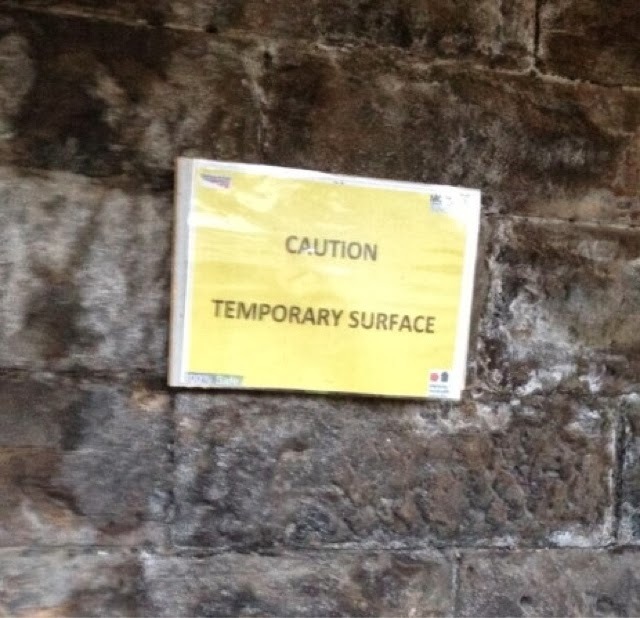 As I read the sign I wondered why they felt the need to warn us about the surface of a wall. I started to imagine what could possibly be temporary about what seemed quite a solid wall. Then I tripped, and realised the temporary surface was under foot not on the wall! I'm sure many people understood what was meant by the sign. 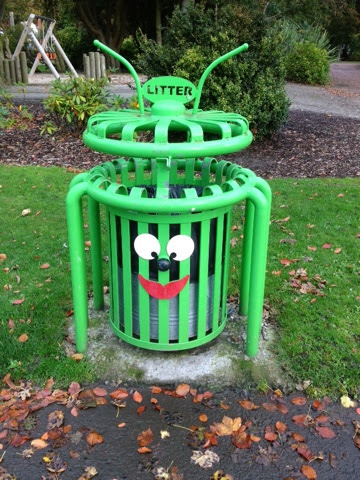 However when communicating with your stakeholders you need to ensure you leave limited room for misunderstanding. Otherwise it might be your stakeholder who metaphorically trips up and blames you for not warning them of the perils of the actions they were taking. This series of blogs is exploring the various routines we run that can negatively impact our performance. The challenge is we are often unaware the impact they're having. Often putting our less than successful outcome down to - age, life, other people, bad luck, the weather, the economy or anything else other than our own behaviour. The proof is in the pudding as they say and therefore often we don't realise the impact something, or its lack, is having until we try. 10 years ago when I first went to Australia it was so much easier to disconnect from email, social media and all other distractions. On both visits, however, I noticed it still took 3 weeks to finally stop all the busyness and constant doing and finally relax. We don't often have the luxury of being able to take 3 weeks off just to relax. The challenge, therefore, is finding things that enable us to let go of the busyness and to relax in a shorter time frame. I've tried many things over the years to do this and the one common denominator for me has been finding tasks that require 100% concentration. It's as if the act of concentrating on one thing allows the other things that were feeding the busyness some time off. So gardening, climbing, sewing, puzzles and writing have all played a part. However this weekend reminded me of another activity that provides this disconnection.... farming...well helping on the farm anyway. How might you disconnect this weekend? How do you start the day? 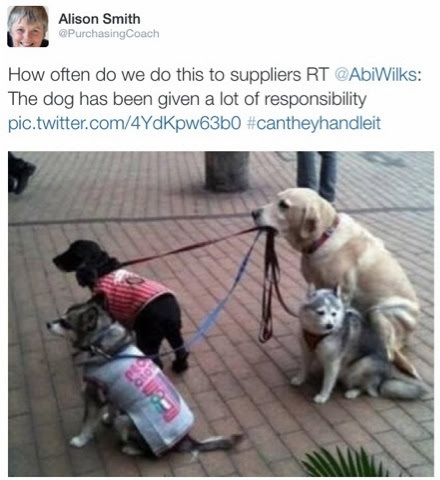 Before I start this blog, first published in supply management, I'd like to make a confession. I don't blog about these subjects because I'm an expert in the content - I blog to learn and be reminded of those things I find difficult. Although with the huge number of hours I've studied these subjects (books I've read, podcasts listened to and lectures attended) I may be more of an expert than I think, just not one who always finds the walking the talk as easy as I'd like. Reflecting on the topics for forthcoming blogs I realised my motivation to blog about subjects I no longer have difficulty with was very low. So no blogs on alcohol and unhealthy relationships and their potential negative impact on our performance. Plenty on eating, sleep, beliefs and other unhelpful patterns that subtly impact our success. 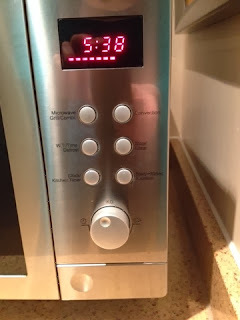 Today I'd like to consider the routines that we run on automatic pilot when we wake in the morning. Before doing that I'd like to consider our goal for the day, because surely that should set the tone for what we do to set up the day so we're best able to do what we have to do. If I want to be inspired today and identify potential opportunities for a project I'm working on then it's useful to consider what I need to do that. Time and a relaxed and open mind spring to mind. It's so easy to forget all these good intentions and jump straight into reading emails and working before we've given our mind, body and emotions time to get used to being up and about. After all, emails will be there all day and if we're not careful we just spend all our time checking, reading and replying to emails, and get to the end of the day and realise the one main action we had aimed to do hasn't even been started (or is that just me?). So as I head to work and realise I need to be inspired what might I do instead of jumping straight onto email? Listen to music or a Tedtalk I find inspiring, go for a walk, look at inspiring images, remember a time in the past when I've been inspired, yoga, exercise, handstands if you feel so minded and so on. I'd love to say meditate, but the closest I get to that would be a quiet soak in the bath. These may only take 20 minutes and could make all the difference to the quality of hours in your day - after all it’s the quality and outcome of the hours you work not the number that's important. What's your goal for today? And what physical, mental and emotional state do you need to achieve that most effectively? What can you do as to provide the appropriate conditions for this state to be available throughout your day? In my last blog I suggested it’s our unconscious routines - when we're on automatic pilot - that can stop us achieving our goals and succeeding. In this blog, first published on supply management's blog, I'd like to explore the motivation we might have for examining our behaviour, because otherwise why would we bother? This is true for any change. If you’re happy with the current outcome, why would you want to change what you’re doing? The premise behind any change is a desire for a different outcome. But I wonder how often we settle for the current outcome, not realising we’re settling for something sub-optimal. 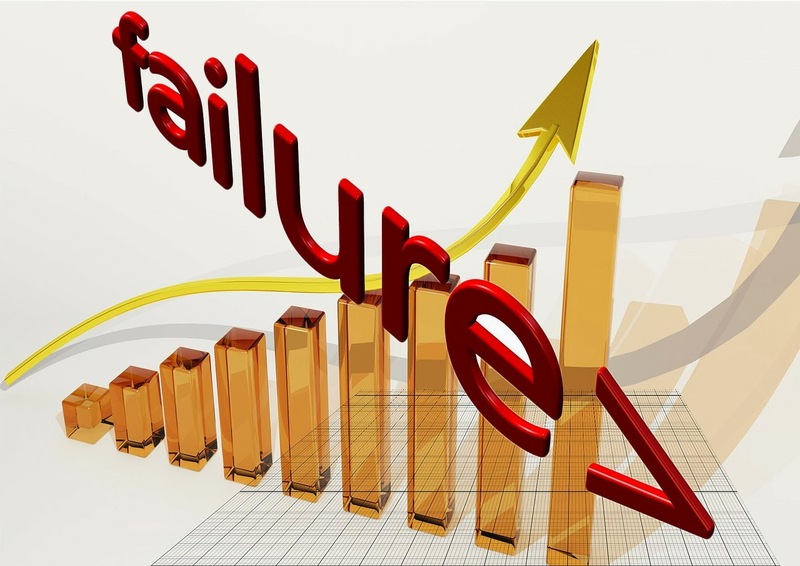 Without these skills things can start to go wrong – for example negotiating sub-optimal pricing, choosing the wrong suppliers, failing to satisfy stakeholders, making mistakes, escalating risks, compromising production, fractious teams, deteriorating customer quality, missing out on innovation and much more. Do you have access to these skills every day? Or does your ability in them wax and wane? Do you have access to each of these skills when you need them? Are you aware of times when you couldn't access them when that might have had a negative impact on your performance? If you're like most people then yes - your abilities will wax and wane, and no - these skills are not always available when you need them. That's normal. What I've found is we're not always aware of what we're doing that could be negatively impacting our ability to access these skills. My upcoming blogs will explore the unconscious routines that can prohibit optimal performance of these skills. Please think about what positive difference having access to these skills would have in your life. Are you on auto pilot? ...Will this be a year of change for you, or the same old, same old? What transpires may not be obvious unless you understand the routines that stand between you and your goals and success. 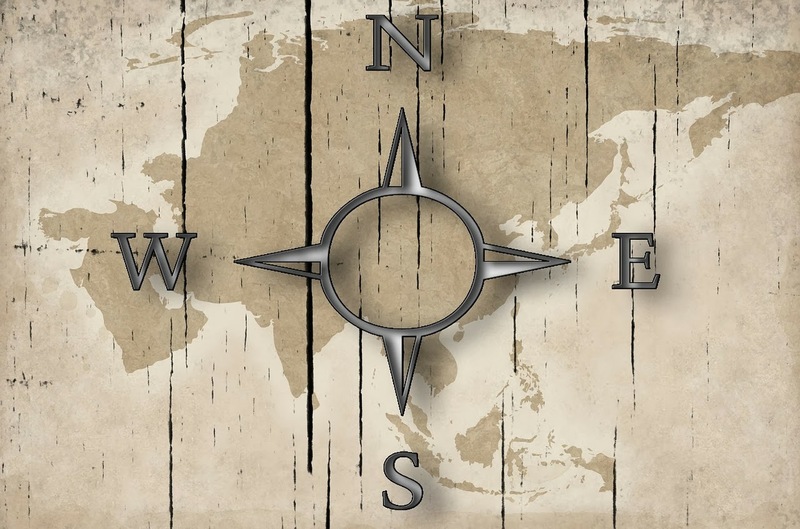 New years (as well as new jobs, new homes, or new anything) are a great time to reassess the routines we use every day, and to determine if they're helping us move in the right direction or holding us back. Routines are simply a set of learned behaviours that over time become unconscious. We stop assessing whether these routines support our success or not, and simply hand over to our autopilot to process the routine successfully. ● We make the first coffee of the day without thought of whether we want a coffee today, or if it really does make us feel better, just because we do it every morning. ● We take a specific route to work because at some point we learned it was quicker. And now we go into automatic pilot, and without any thought of the route we've taken or considering the quicker, cheaper or less stressful alternatives. ● We walk to the canteen at lunch, grab a sandwich and then return to our desk to eat it as we continue working, without thinking whether an alternative lunch break might be better for us and the work we're doing. A routine emerges after we've followed the same set of procedures for a period of time (anywhere from three to 28 days according to the many books that address facilitating personal change). But there are numerous challenges when trying to set establish new routines that can have us falling back into the same old ways. ● How new is the situation? If it feels too much like the old situation you'll find it very easy to run the old routine within it. ● How hard is the new routine? If it's too difficult, again, it will be easy to fall back into old, known and easy to follow routines. ● How many others around you follow the old or new pattern? Going with, and not against, the routines of others around you will always be easier. Your motivation to make the change is often the only thing that will make the difference to the outcome. It's the motivation to change that will allow you to stay conscious long enough for the new behaviour to become routines that you can do on automatic pilot, and not fall back on the old unresourceful methods. In other words, the bigger the motivation, the better. What changes do you want to make for 2014? More importantly what patterns do you need to stop running? And what action do you need to take to ensure the new routines stand a chance of becoming available to your automatic pilot? 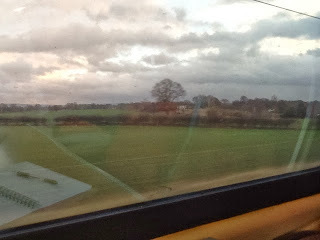 Earlier in the week I was passenger in a car using my mobile phone as a sat nav. As a result we were both introduced to a new, more direct, route to our destination. Isn't that what we often do in life - do what we know and what works well for us, whilst remaining oblivious to the options to do things better, quicker or easier. I was reminded of this again when having a joint "sharing" session on Microsoft with a friend. I was sharing how I use PowerPoint and she was sharing how she uses Excel. I don't think either of us considered ourselves to be novices in the programmes and yet we both learnt so much. Yes we had specific questions we wanted to be answered but the greatest learning came from the shortcuts we saw the other taking "hang on a minute how did you do that?" was a common utterance during our session. The learning ladder explains what is going on. 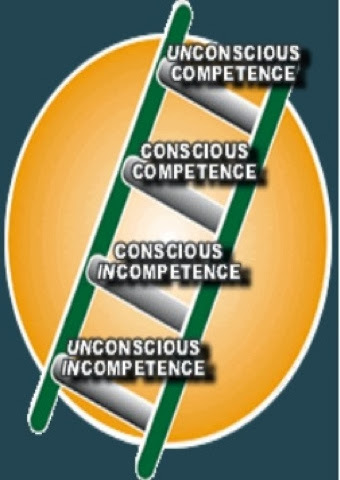 When we're at the bottom of the ladder and unconsciously incompetent we don't know what we don't know, and are unaware of the potential and possibilities. Then we realise what we don't know and move to conscious incompetence. This awareness often acts as a motivator to take action. As we learn the new skill we then become consciously competent, and slowly as the new skill moves into our unconscious we become unconsciously competent. For those who have learnt to drive its easy to see the stages you went through along the way. Moving from not knowing what you didn't know, to suddenly realising there was soooo much to learn, to then being very aware of every little thing you were doing (steering, accelerator, brake, mirrors (yes all of them). At the same time as noticing the road conditions and what the other road, and pavement, users were up to. Finally you get to the point where you get to your destination and wonder how you got there. The stages that are the most "dangerous" are when we're unconscious. Unconscious incompetence means we have no understanding that there may be something we don't know. Which means we don't look for the options, nor take action to explore new ways of doing things. Which is what we had been doing when using Excel and PowerPoint, and when driving that route. Unconscious competence means we find it difficult to teach others and take for granted what we know. We assume that the patterns we've developed are the most effective means of doing what we're doing. We forget why we do it this way and just do it. Whilst staying conscious of our level of awareness for a task can be tiring (because it's using up conscious brain power) its certainly a useful means of being in an optimum position to remain open to new information and new ways of doing things. Where are you unconsciously incompetent and how might you raise your awareness to ensure you're more effective* in an area in your life? * When reviewing the need for change its always useful to consider your current situation. If you're achieving what you want in life and you're doing it in a way that positively supports your mental, emotional and physical well being then its simple and no change is needed. The key is noticing dissatisfaction, ineffectiveness, frustration, anger, tiredness, stress or difficulty in achieving what you want. These are all clues that a change in behaviour could provide some benefit, and therefore it might just be worth the effort to take action and try something different.